We will be closed Easter Sunday- have a blessed day! This is a semi-annual sale where you get 30% off fabric for your back of any completed top that you bring in! The discount only applies if your top is present and only for the amount of fabric you will need for your back. 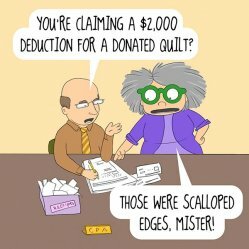 So gather up those quilt tops and come find a backing for 30% off! These are just a couple of new lines and a kit that we have. Be sure to check in for all the new spring lines coming in! We have been making new kits too. Big spider mums, bugs and beautifully colored basics comprise this line! We have charm packs and we have made fat quarter packs, along with bolts! orange and gold accents on bolts. For the full line there are layer cakes and charm packs! 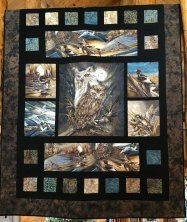 54" x 67" and we call it Wildlife Bricks Quilt on our web store. Join us for a day of open sewing with friends. Always the first Friday of the month. We are continuing with our Midnight Clear quilt. We are nearly to the end so watch for a new BOM starting in May! These are open sew days with Toni. She is there to help you with any of her foundation patterns. You can also use the time for any makeup class Toni teaches including the dragon fly and humming bird kits from Hoffman. She can also help with the laser precut Crystal kits from Hoffman. You can join at any time! While in Arizona last year, Toni took a class to learn how to make these fun book case quilts. You can totally customize them to your reading preferences! 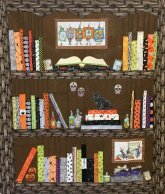 It is no surprise that Toni's 1st book case has a Halloween theme. She is working on a Harry Potter themed one now. Much of the pattern she has printed on her foundations. Bring your imagination and create your own one of a kind book case. We decided we need to make this get together a regular event each month! Several gals with embroidery machines wanted to get together for 3 days of sharing and embroidering. If you have a machine and would like to join in you are welcome to. They plan on leaving the machines set up for the 3 days. Come for all three days but if you can only come for one day that is ok too. If machine embroidery is something you have been thinking about doing, come check out what all the fun is about! This wall hanging measures 43" x 51" and is designed to be a block of the month. Sharon will start on the old truck block and will see how it goes from there. You can choose to machine applique using cotton fabrics and fusible. You can also choose wool applique if you wish. 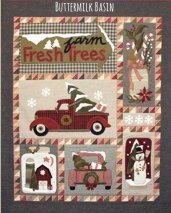 You will be picking out your own fabric choices for background and appliques. We have been missing getting together to work on our hand projects so we set aside a day to do just that! If you have a project you are working on or want to learn wool applique or new embroidery stitches come and join us. We are always happy to share what we are learning! Deer Country Quilts is for sale by owner. Serious inquiries are welcome.